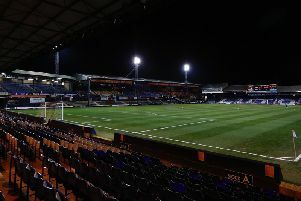 Luton defender Jack James suffered a nasty head injury as Havant & Waterlooville lost 2-1 at home to Leyton Orient in the National League on Saturday. James was only on for nine minutes until the clash of heads, as he needed 17 stitches, with Hawks going on to lose 2-1 to the visitors, for whom ex-Town keeper Dean Brill was in goal. Striker Aaron Jarvis came off the bench for the final 10 minutes as Falkirk drew 1-1 at Greenock Morton in the Scottish Championship on Friday night. The visitors had been reduced 10 men by this stage, Paul Dixon sent off, but still held on for a valuable point. Jarvis then played the first half as the Bairns beat Motherwell 4-2 in the SPFL Reserve League on Monday afternoon. Midfielder Arthur Read made his first start for Hemel Hempstead as they lost 1-0 at Slough in the Vanarama National League South. Frankie Musonda also got through 90 minutes for the Tudors in their home defeat as well. Drew Richardson played as Harlow Town drew 1-1 with Brightlingsea in the Bostik League Premier Division. The U18s midfielder had a great chance to seal all three points late on, but saw both his efforts saved by keeper James Bradbrook. Harlow were back in action on Monday night too, beaten 2-0 by Carshalton. Jake Jervis was an unused substitute for AFC Wimbledon as they held Shrewsbury to a 0-0 draw in League One, as was Lloyd Jones in Plymouth Argyle’s 2-0 defeat at Sunderland. Luke Gambin didn't play as Crawley lost 1-0 at MK Dons in League Two, while neither did Jack Senior as Harrogate Town drew 0-0 at home with Dagenham & Redbridge in the National League.